Half of all GOP voters haven't decided who should be their nominee for the U.S. Senate, according to the new University of Texas/Texas Tribune poll. Four months before the Republican primary, half of all GOP voters haven't decided who should be their nominee for the U.S. Senate, leaving the race wide open, according to the new University of Texas/Texas Tribune poll. 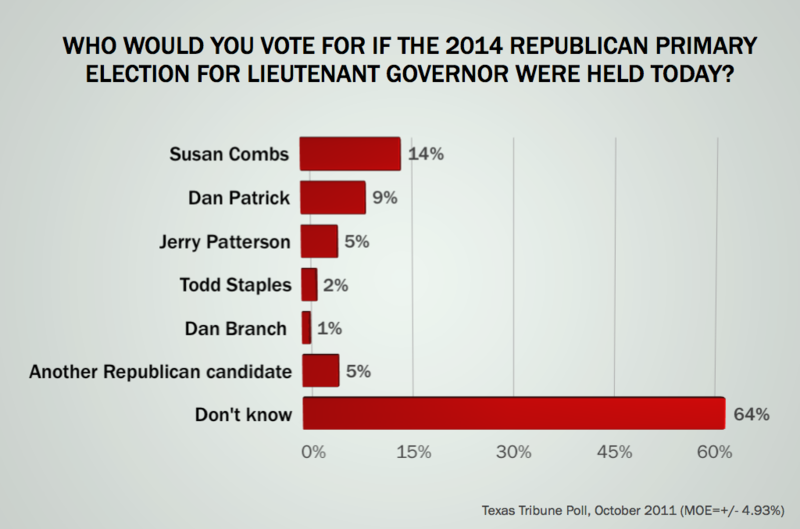 Among Republican voters who have chosen a candidate, Lt. Gov. David Dewhurst comfortably leads the field. "I don't think the public is paying attention to the Senate race right now," said Jim Henson, who teaches government at UT, runs the Texas Politics Project there and co-directs the UT/Tribune poll. "I think that it's clearly a matter for insiders and political junkies. It's even more the case with Gov. Perry running for president. The news media are all covering Perry, and not this race." Meanwhile, retired Army Lt. Gen. Ricardo Sanchez — the only announced Democratic candidate for the seat being vacated by U.S. Sen. Kay Bailey Hutchison — has the support of just 11 percent of his party's primary voters, according to the poll. Like the Republicans, most of the Democrats haven't decided on a candidate. Dewhurst has the support of 22 percent of the self-identified GOP primary voters, followed by former Solicitor General Ted Cruz at 10 percent; U.S. Rep. Michael McCaul and former Dallas Mayor Tom Leppert at 5 percent each; and Railroad Commissioner Elizabeth Ames Jones at 2 percent. The only other named candidate in the survey — Glenn Addison — got no votes. Seven percent of the respondents prefer "another Republican candidate," and 50 percent said they don't know who they would support in a race held today. "I think it's a serious race," said Daron Shaw, co-director of the poll and a UT government professor. "Those who thought Cruz was using the Senate race as a proving ground, they may want to think again — I think it's going to be a horse race." Leppert, who has so far kept pace with Dewhurst on campaign funds, is in the hunt as well, Shaw said. 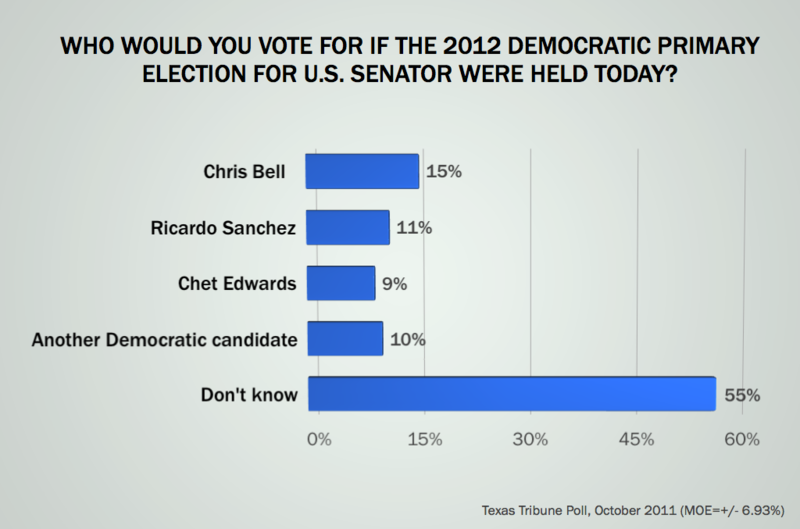 On the Democratic side, former U.S. Rep. Chris Bell of Houston got 15 percent, followed by Sanchez at 11 percent and former U.S. Rep. Chet Edwards of Waco at 9 percent. Ten percent want another candidate and 55 percent remain undecided. 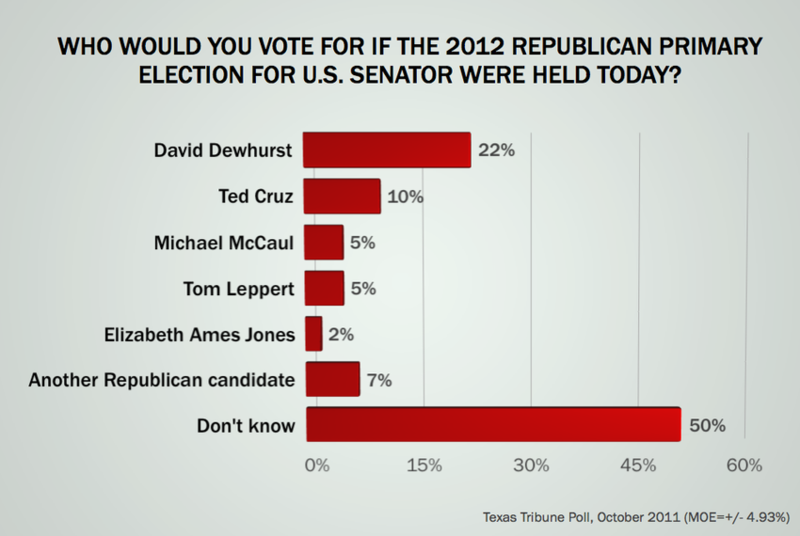 Dewhurst's entry into that 2012 race for the Senate ignited a 2014 race for his job. The race is even more wide open than the contest for U.S. Senate — almost two-thirds of the respondents haven't decided on a candidate. Comptroller Susan Combs has the lead right now at 14 percent; followed by state Sen. Dan Patrick, R-Houston, at 9 percent; Land Commissioner Jerry Patterson at 5 percent; Agriculture Commissioner Todd Staples at 2 percent; and state Rep. Dan Branch, R-Dallas, at 1 percent. McCaul announced last week (on the last day the poll was in the field) that he will not seek the nomination for U.S. Senate but will instead run for re-election to Congress next year. He would have been the only member of Congress in the race and could have seen some voter scorn for his current job. Asked to rate the job Congress is doing, only 11 percent of the poll respondents approved (only 2 percent strongly approved), while 77 percent disapprove of Congress, including 51 percent disapprove strongly. Only 10 percent neither approve nor disapprove and only 2 percent said they didn't have an opinion. Among the Democrats, Bell and Edwards are touted as possible candidates for U.S. Senate but haven't campaigned or declared. They could face that same voter distaste for Congress if they join the race. The Republicans start the election cycle with a strong edge. Asked whether they would prefer an unnamed Republican or an unnamed Democrat in the Senate race, the respondents gave the GOP a lopsided 47-30 lead. The latest UT/Tribune internet survey of 800 registered voters was conducted October 19-26. The margin of error is +/-3.46 percent. On questions of Republican voters, the MOE is +/- 4.93 percent; on questions asked only of Democratic voters, the MOE is 6.39 percent.